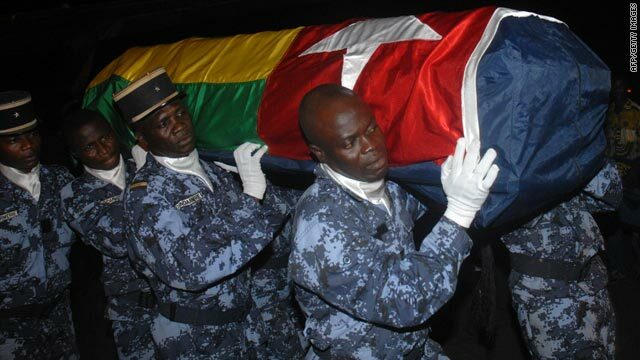 Togolese gendarmes carry a coffin containing one of the victims of the gun attack in Angola. (CNN) -- Togo's national soccer team have been officially disqualified from the 2010 Africa Cup of Nations by the Confederation of African Football (CAF). The region's governing football body for football has confirmed that the team, known as the "Hawks", will take no further part in the tournament being hosted by Angola after failing to appear for their first group game against Ghana on Monday, according to CNN affiliate ITN. The squad flew back home to Togo after three of their traveling party were killed and two players seriously injured by a machine-gun attack which occurred as their bus crossed the border into the northern, oil-rich state of Cabinda on Friday. Group B has now been reduced to three teams: Ghana, Ivory Coast and Burkina Faso -- the latter two drew 0-0 on Monday. 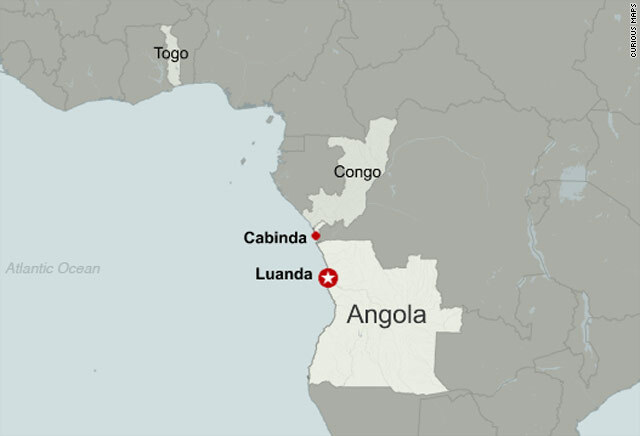 Angolan authorities have arrested two people involved in the attack, state media reported, while goalkeeper Kodjovi Obilale remains in a stable condition in a South African hospital but needs a ventilator as he recovers from being shot. The CAF has also ordered a moment of silence to be observed in memory of the slain Togolese before each match in the first round of the tournament, it announced Monday. There had been conflicting reports about whether Togo would take part after several players were quoted saying that they wanted to stay in Angola and play, before being ordered to leave the country by their government. Later reports then quoted Togo sports minister Christophe Tchao as saying he had requested that the CAF keep his country's place in the tournament open in case they returned to Angola. But the UK Press Association reported that the CAF had received no such request. "Togo have not taken official steps to come back and play the African Nations Cup," it quoted an unnamed CAF official as saying before Monday night's abandoned match. "The referee has received the order to blow the starting whistle and if the Togolese players are not there, they will have lost the match and will be disqualified." Meanwhile, Mali and Barcelona midfielder Seydou Keita believes the tournament should have been called off in the wake of the attack, PA reported. "If only the competition had been cancelled," he said. "You can't leave home to die. "Personally, I have to say that I am scared because I don't know this country. After seeing what happened to Togo, I am scared. You don't know when a problem could happen again. My only worry is returning home. "Football has become something very important throughout the world, and the image which has been left following the attack is something very bad for African football. We came here to play, not to die." The head of South Africa's World Cup organising body, Danny Jordaan, has told CNN that his country will not suffer the same security lapses that have occurred in Angola. "We have shown our ability to safeguard events since 1994," Jordaan said. "In 140 events we have not had a single incident. "You can draw up a list of countries with that track record and you'll find very few in the world."